If you aren't a fan of chicken thighs, then by all means use chicken breast. Just remember to watch it carefully while on the grill and adjust for the appropriate cooking time. If you're a fan of Thai chilies, then use them in this recipe instead of the pepper flakes. 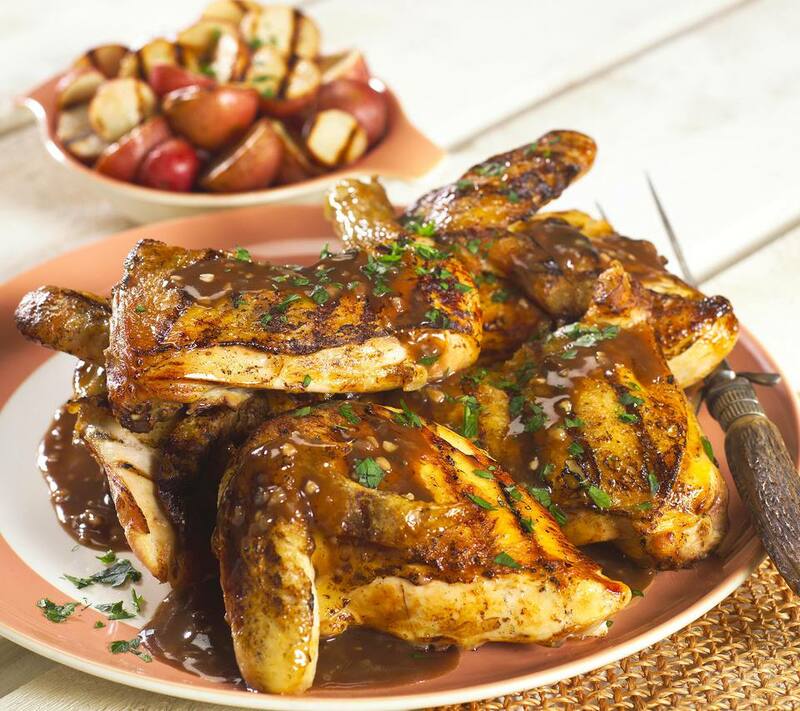 Place de-boned chicken thighs in a large zip-top plastic bag or shallow glass dish. Place cilantro leaves, garlic cloves, vegetable oil, soy sauce, rice wine vinegar, sugar, pepper flakes (or Thai chilies), salt and black pepper into a food processor. Pulse 10 times. If the mixture is still too chunky, pulse a few more times. Pour mixture onto chicken thighs and toss well to coat. Seal bag or cover dish, place in the refrigerator, and allow to marinate for 3-4 hours. Preheat grill for medium-high heat. Remove chicken from refrigerator. Place chicken onto grill and cook for 10-12 minutes per side or until internal temperature at thickest part of meat reaches 165 degrees F/75 degrees C. When cooked through, remove from heat. Garnish with chopped cilantro and serve over rice with grilled vegetables. Chicken breast option: If choosing to make this with chicken breasts instead of chicken thighs, repeat the processes listed above, however, I recommend pounding the breasts to a 1/2 inch thickness. This will allow the breasts to cook quickly and evenly, without running the risk of them drying out or burning. Use 4-6 small to medium boneless, skinless breasts for this recipe. To flatten, simply place 2 breasts each between two large pieces of plastic wrap. Using a smooth kitchen mallet or rolling pin, gently hit until there is a uniform 1/2 inch thickness. The chicken breasts will have a much larger surface area. You can either cut them in half at this point or leave them as is. Grill for 6-7 minutes per side, or until they reach 165 degrees F/75 degrees C.
Baste option: If you'd like more sauciness to the chicken, double the marinade recipe and use half of it as a baste while on the grill. Only baste the chicken during the first half of grilling time. Discard any remaining baste after that.